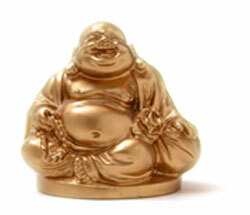 Buddha’s Bellyaching » Brian’s was better. Brian’s was spot on. Mine makes me seem more of a hermit than… wait a minute, I guess that’s fairly accurate. Brian got Power-ups, though! I want a power-up. You’re incredibly introverted and introspective. You live inside your head. You spend a lot of alone time meditating and thinking. People see you as withdrawn, and at times they are right. You are caring and deep, but it may be difficult for you to show this side of yourself. UPDATE: I am a moron. You are a virtual roller coaster of emotions, and most people enjoy the ride. Your mood tends to set the tone of the room, and when you’re happy, this is a good thing. When you get in a dark mood, watch out – it’s very hard to get you out of it. It’s sometimes hard for you to cheer up, and your gloom can be contagious. That’s odd. Sixpence and myself had the same exact reading. August 20th and October 20th are similar? Probably why we are arch-villians of one another. Perhaps gullibility should have been listed as a weakness. Mine was absolutely wrong. I love machines and I have trouble finding people to spend time with.